The name says it all. A stylish apartment. Prestigious and classic. For those whose standards are higher than most. Available as a one-bedroom configuration or as two bedrooms (as illustrated) by adjoining with a Vista Suite. Stately. Commanding and majestic. Perfect for entertaining. Enough living space to roam. The pinnacle of good living. Available as a one-bedroom configuration or as two-bedrooms (as illustrated) by adjoining with a Veranda Suite. 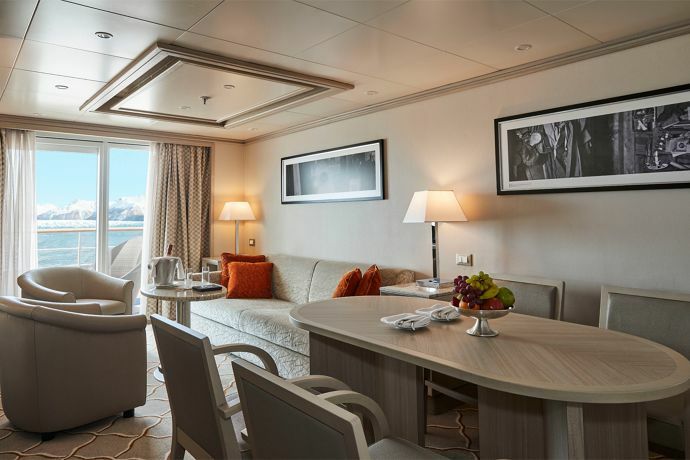 The Midship Veranda Suite offers unbeatable views. 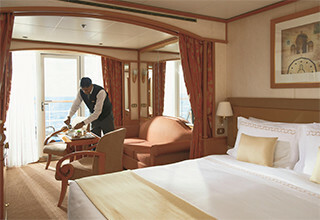 A Silversea signature. Spacious and welcoming. Floor-to-ceiling glass doors open onto a furnished private teak veranda. Each spectacular sunset feels like it is yours alone. 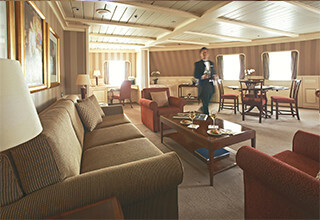 The Midship Veranda Suite offers a preferred central location with identical accommodation to a Veranda Suite. 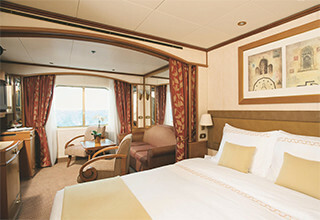 No top cruise line would be complete without such a luxury. 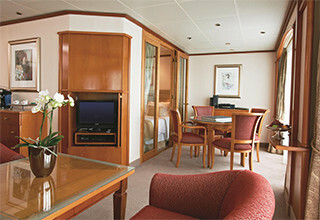 A Silversea signature. Spacious and welcoming. Floor-to-ceiling glass doors open onto a furnished private teak veranda. Each spectacular sunset feels like it is yours alone. 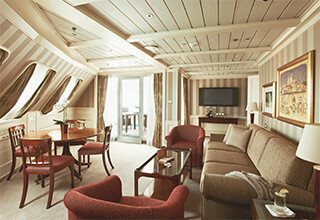 Some Veranda Suites accommodate three guests. A quiet sanctuary. The sitting area has plenty of room to relax. Large picture windows frame panoramic ocean views. The perfect backdrop for breakfast in bed. 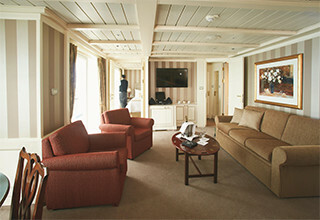 Some Vista Suites accommodate three guests.